Stan Lee has freely admitted that the X-Men were created out of laziness. He was sick of having to come up with new origin stories for characters, so he created the mutant race. Known by scientists as "homo superior", mutants are just like regular humans until they hit puberty, at which point they develop super powers. Although he didn't know it at the time, Stan Lee had just created Marvel's most popular property of all-time. The plight of the mutant race struck a chord with audiences across the world, and they have been used as an allegory for any minority that is fighting for their rights. Such lofty ideals weren't on Stan Lee's mind when he created Bobby Drake, better known as Iceman. He probably scrapped the origin story wherein Bobby drank a soda that had radioactive ice cubes in the glass, and just made him into a mutant. Ever since the 1960s, Iceman has been an important member of the X-Men. He was a key player in many major storylines, and still fights for Professor Xavier's dream to this day. Despite his incredible power, Bobby Drake has always been the slacker heart of the X-Men. Marvel has recently been publicizing the release of a new Iceman comic series, due to come out in spring of 2017. The coolest X-Man of all-time is about to get the spotlight to himself. Today, we're going to beat Marvel to the punch, and give Iceman the love he deserves. From his on-screen origins, to the huge revelations about his personal life. Here are fifteen things you didn't know about Iceman. The order in which Professor Xavier met the members of the X-Men has been retconned many times over the years. In The X-Men #1, Jean Grey is welcomed to the X-Men as its fifth member, with Cyclops, Iceman, Angel, and Beast already part of the team. As time went on, it was established that Xavier had interacted with other future X-Men before the formation of the original team. When travelling in Egypt, a young Storm picked Xavier's pocket. Amelia Voight was Professor Xavier's lover, and a fellow mutant before he formed the X-Men. She would leave him and join Magneto. It was established in later comics that Xavier had another person in mind to join the original X-Men, a mutant named Sage. He changed his mind, however, and instructed Sage to infiltrate the Hellfire Club as a spy. While Professor Xavier was training Jean Grey in the use of her powers before he formed the X-Men, the official first member was Scott Summers, who would go on to become Cyclops. With one teenage mutant in tow, Xavier decided to reach out to others. Bobby Drake first used his mutant powers while on a date with a girl. A local bully tried to take her away from him, so Bobby froze him in a block of ice. The local sheriff locked Bobby up in prison, as an angry mob gathered to kill him. He was freed by Cyclops, and saved from the mob by Professor Xavier. After Xavier speaks to his parents, Bobby is accepted into Xavier's School for Gifted Youngsters. Before the release of the classic X-Men cartoon in the 1990s, Marvel's most famous mutants had always been relegated to cameo roles. The first appearance of the X-Men on the small screen was in a cartoon called Marvel Superheroes: Prince Namor the Sub-Mariner. In the episode "Dr. Doom's Day/The Doomed Allegiance/Tug of Death", the original X-Men appear as a team called the "Allies of Peace". The reason for this change is not known, although it is believed to be due to a rights issue. In 1989, a pilot episode was created for a possible X-Men cartoon series. It was called X-Men: Pryde of the X-Men, and it followed the second generation of the team. While the series was not picked up at first, it did form the basis for the X-Men arcade game. The X-Men would finally get their own animated series in 1992. With the release of Spider-Man and his Amazing Friends in 1981, the X-Men first received regular representation. One of the titular Amazing Friends was Iceman, voiced by Frank Welker (maybe the most prolific voice actor alive). Not only was he sharing the screen with the most popular superhero of all time, he got to mack on his fellow Amazing Friend, Firestar. He mainly did this with the aid of ice puns, and PG innuendo. In the mainstream Marvel universe, several scientists have come up with different classifications for the power levels of mutants. These rules are not set in stone, however, as writers tend to have their own opinions on how powerful a character is. After all, Spider-Man once beat a Herald of Galactus in a fist fight, for no reason other than the writer loving Spider-Man. The mutant power classification system uses Greek letters to represent tiers. The lowest of these are Beta level mutants, followed by Alpha, and Omega. The Omega level mutants are those who have the power to destroy the world if they so chose. They are some of the most feared heroes and villains of the Marvel universe. Counted among these are Legion, the son of Professor Xavier, who has the power to go back in time, travel the cosmos, and shape reality itself. Iceman, too, is classed as an Omega level mutant. This might seem like a silly idea, especially if you only know Iceman as the guy who drops blocks of ice on his enemies. The thing is, Iceman is always holding back. The nature of his power is to decrease thermal energy, and he can do it on a global scale if he so chose. Iceman could usher in a new Ice Age if he wanted to. Luckily, he's a laid back kind of guy who never takes the superhero stuff seriously. At least, that's what he wants people to think. Iceman's powers scare him on some level, and his jokey attitude has been hinted as being a facade - a means of coping with the apocalyptic abilities at his fingertips. Before she joined the X-Men, Emma Frost was known as the White Queen of the Hellfire Club. She was one of the X-Men's most bitter enemies, and was one of the key players behind the (accidental) creation of the Dark Phoenix. When a new team of teenagers known as the New Mutants was formed by Professor Xavier, Emma Frost formed her own team called the Hellions to oppose them. Most of the Hellions were killed during an attack by the Sentinels. Emma Frost was injured during the attack, and was forced into a coma. The X-Men take her into their care, and is she left to heal in the mansion's medical ward. Iceman is taking care of Emma, when a power outage in the medical ward awakes her. Due to her injuries, she possesses Iceman's body in order to escape the mansion and learn the fate of the Hellions. The X-Men pursue her, but are quickly outmatched by Emma's use of Iceman's body. She uses his powers in frightening new ways that no one had ever seen before. In a few hours, she proved that there was more to Bobby Drake than even he knew about. The most iconic use of Iceman's powers is his patented "Ice Sled". Even his action figure in the 90s came with an Ice Sled for him to stand on. Through the use of his powers, Iceman can propel himself forward by creating a kind of ice roller-coaster track. This was his primary method of movement throughout most of his career. When Emma Frost possessed Iceman's body, she did something that no one had ever seen before. Emma Frost broke down Iceman's body into liquid, and moved through a body of water. This came as a shock, as liquid had never been part of Iceman's repertoire before. Once he regained control of his body, Bobby began training himself to further expand the range of his powers. Like Emma before him, he mastered the liquid form of his body. As time went on, Iceman discovered even more powerful variations of this ability. Along with his own liquid form, he can transform other people into liquid and carry them through large bodies of water (although this is very physically draining, and cannot be used repeatedly). He also gained the ability to turn into vapour, allowing him to travel as a gaseous cloud. These three forms allow him to transform into the three states of matter for liquid - water, ice, and mist. In 2005, Marvel Comics held a company-wide event known as "House of M". Scarlet Witch of The Avengers had gone mad, and used her magic to remake reality in her own image. At the end of the event, reality is restored, but Scarlet Witch removes the powers of 99% of the world's mutant population. In the space of a day, the number of mutants went from millions, to a few hundred. It should come as no surprise that the mutants who kept their powers also happened to be the popular characters. Most of the regular X-Men cast were unaffected. The one big exception to this was Iceman. He was probably the highest profile mutant to lose his powers. This state of affairs only lasted a year. In X-Men #178, Iceman is about to be shot in the head by anti-mutant terrorists, when his powers reactivate. Emma Frost searches through his mind, and discovers that he had been purposely repressing his powers due to the shock of surviving "House of M". It took the threat of death for Iceman to gain control of his powers once more. Usually when a superhero team is created, a reason is given for all of the individuals to join together. The X-Men exist in order to make Professor Xavier's dream of a peaceful co-existence between mutants and humans come to pass. The Runaways were formed in order to stop The Pride from taking over the world. The Avengers joined together in order to protect the Earth from cosmic threats. The west coast of America has always been sorely lacking in superhero representation. This is because most comic writers are based on the east coast, so they collectively made New York City into the centre of the universe. Los Angeles finally got a superhero team in the form of The Champions - a group seemingly picked from random characters. Iceman was one of the founding members of the team, along with Beast and Angel of the X-Men. They were joined by Hercules (the Greek god, turned Avenger), Black Widow (former Russian spy, turned Avenger), and... Ghost Rider (the spirit of vengeance). The Champions had their own series that ran for three years, before being cancelled. They never had any cohesion as a team, and faced an assortment of villains who weren't doing anything else at the time. Iceman has the ability to change his body into numerous forms. The form that most people associate the character with is his solid ice body with the square head. One of the extensions of his power is the ability to alter his physical body into an ice form (and transform back into flesh & blood). This ice body acts like a form of armour that shields him from damage (due to the durability of hard-packed ice). He later learned that he could regenerate his physical body if he transform into the ice form quick enough. When Iceman first appeared in The X-Men #1, he looked like a snowman wearing a pair of boots. He had no discernible features, outside of small black holes where his eyes should be. It would have been more accurate to call him "Snowman" during this period, as he mainly used snow based attacks. 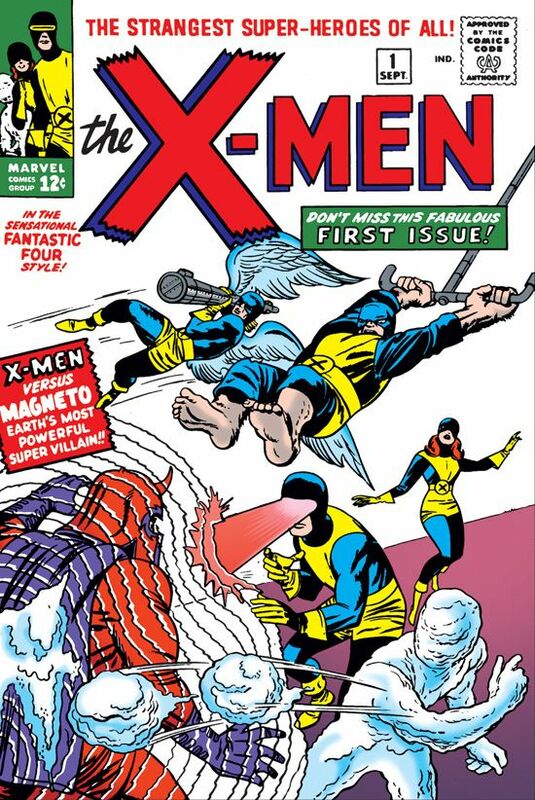 He can be seen throwing a snowball at Magneto on the cover of The X-Men #1. The master of magnetism must have been quaking in his boots at the thought of the tiny rocks that may have been hidden in that snowy missile. Xavier's School for Gifted Youngsters is right behind Hogwarts on the list of "schools we wish we could go to". In real world terms, while the school would probably be really good at teaching kids how to fight Sentinels, it seems like it would lack in teaching academic abilities that can be used in finding employment. Of all of the members of the X-Men, Bobby Drake is one of the few who wised up and got a real degree. When the second generation of X-Men took over, the original five members of the team all went their own ways. Cyclops, Jean Grey, and Angel would eventually rejoin the team, while Beast would join the Avengers. Iceman decided that being a superhero wasn't going to pay the bills, so he went back to college. Iceman studied accounting at UCLA, and he earned a degree in accounting. He still remained a backup member of the X-Men during this period, and would come to the team's aid in an emergency. If Professor Xavier's dream of humans and mutants living together peacefully ever comes to pass, then Iceman is one of the few members of the X-Men with a skill that's usable in the real world. If an employer was looking for an office worker, then they are not likely to be impressed by seeing "Optic Blasts" or "Adamantium Skeleton" on a résumé. Iceman has the ability to create structures out of ice. The level of detail is determined by his own imagination, as his mastery over his powers has reached the atomic level. For most of his superhero career, Iceman was not able to make the ice sculptures move of their own accord. In that respect, he is weaker than Elsa from Frozen, who has the ability to impart life into snowmen. This all changed during the "Battle of the Atom" event in 2013, when Iceman showed off a new extension of his abilities. It was revealed that Iceman can create basic ice structures that possess a rudimentary intelligence. One of these sculptures actually rebelled against Iceman, and joined the Brotherhood. Having the ability to create ice people makes no sense within the scope of his powers. The ability to alter thermal energy in no way extends to granting sentience. Creating an ice clone army whose only purpose is to get smashed up by the X-Men's foes also presents a range of ethical issues... that will be ignored, because it's only a comic book. When the second generation of X-Men were introduced in Giant-Size X-Men #1, the original team all retired from being superheroes... for a short time. The original X-Men would go on to form a a new team called X-Factor. While the X-Men fight for Professor Xavier, X-Factor worked for the American government. Many famous X-Men characters, like Apocalypse, first appeared within the pages of X-Factor. It was during his time with X-Factor that Iceman gained the attention of Loki, the Norse God of mischief. Loki was scheming of a way to try and enhance the size of the ice giants of Jotunheim. With their help, he could annihilate the other gods, and become the ruler of Asgard. Loki believed that Iceman was the key to this, and he kidnapped him. Loki vastly increased Iceman's powers, to the point where he could no longer control them. After X-Factor saved him, Iceman required a special belt that helped him to control his powers, until he could learn how to do it himself. The long term effects of this transformation are debatable, as we have seen many alternate reality versions of Iceman (like in the "Age of Apocalypse"), that possess the same level of power as the Iceman from the main line of comics. In 1994, arcade fighting games were printing money all across the world. This was also a period when X-Men was Marvel's most popular property. This was due to the success of the animated series leading to an increase in comic sales. It was only natural that the two should come together, and it was Capcom that stepped up to the plate. X-Men: Children of the Atom was the first of many Capcom fighting games to include the team. Iceman was one of the ten playable characters in the game. In terms of fighting style, Iceman is all about range. Even his basic attacks are extended with weapons made from ice, and he has a diverse assortment of ranged attacks. Not only can he fire beams of cold, but he can also create blocks to ice to fall on the enemy from above. His most impressive attribute is that he is immune to chip damage, and is one of the best characters to be played defensively. If you complete X-Men: Children of the Atom with Iceman, you get to see him celebrate his defeat of Magneto. Iceman's ending sequence shows him hanging out with bikini babes on the beach, while trying to impress them with detailed ice sculptures. In 1995, Marvel ran a company-wide event known as the "Age of Apocalypse". Professor Xavier's son, Legion, goes back in time to kill Magneto. He accidentally kills Xavier instead, and creates an entirely new timeline. In this new world, Apocalypse has taken over most of America, and Magneto leads the X-Men in rebellion against him. One of the members of Magneto's X-Men is Iceman. Unlike the one we know from the main line of comics, this version of Bobby Drake has no problems with killing. He uses his mutant ability to freeze the water molecules in the bodies of Apocalypse's soldiers... and shatters them. It was due to the more warlike setting in which he lived that Iceman attained mastery over his powers in a much quicker fashion. Marvel has returned to the "Age of Apocalypse" on several occasions. Many of those characters have managed to find their way into the main line of comics (like X-Man, Sugar Man, and Dark Beast). Iceman is one such character. Tired of the endless conflict, Bobby Drake was offered transportation to the main Earth of the X-Men. He lived a hedonistic lifestyle in the city of Madripoor, before eventually being killed by Nightcrawler. Iceman has played a huge role in the X-Men movies. A lot of attention was given to his burgeoning romance with Rogue, which ran into problems when he began to fall for Kitty Pryde. When X-Men: Days of Future Past was released in theatres, most fans were confused by the lack of Anna Paquin's Rogue (outside of a small scene at the end of the film). Her absence was notable, as it was known that she had been part of the production. It was eventually revealed that there was an entire subplot about Rogue during the future timeline that needed to be cut due to the film running too long. These scenes were restored in the "Rogue Cut" of the movie, which included seventeen minutes of new material. In the "Rogue Cut", Kitty Pryde is wounded, and her ability to keep Wolverine in the past is fading. Iceman reveals that Rogue is still alive, and is being experimented on in the ruins of the X-Men's mansion. With her ability to steal powers, she could take Kitty's place while she recuperates. Iceman leads a mission to save Rogue, and he sacrifices his life in battle against the Sentinels in order for it to succeed. One of the most recent storylines in the current X-Men comics involved the original team from the 1960s being stuck in the present day. While highly acclaimed, these stories have been overshadowed by a single event that happened in All-New X-Men #40. It was in this comic that the 1960s version of Bobby Drake is asked about his sexuality by Jean Grey. It is revealed that Iceman is gay, and has always been ever since his first appearance. In Uncanny X-Men #600, the past Iceman confronts the present day Iceman, who finally admits that he too is gay. Some fans have taken issue with this reveal, and not in the usual bigoted way that you might expect. The question of why this information has taken so long to come out is a valid one. Bobby Drake has been on the superhero team with possibly the most amount of psychics in comics history. Professor Xavier, Jean Grey, and Psylocke have all read Iceman's mind at some point or another. Emma Frost literally took over his mind & body when she escaped the X-Mansion. This isn't even counting the many evil psychics that have battled the X-Men over the years. Did all of these characters agree to never bring it up, including the times when they turned evil, such as when Professor Xavier created Onslaught? That is the nature of comic books, however. It is the current writer who decides what is happening, and Brian Michael Bendis has retconned fifty years of Iceman's sexuality. When asked about the comic, Iceman's creator, Stan Lee, stated that he never envisioned Iceman as being gay. With that being said, he fully supports the move, and is fine with Iceman being gay, so long as the writers continue to create great stories that involve him.